After the iPhone XS launch, Apple quietly discontinued the iPhone SE, a device it announced all the way back in March, 2016. The move comes without an immediate successor and no word on how much longer stores will stock the device. Apple’s reportedly working on a successor for the iPhone SE, but iPhone SE 2 rumors have stalled and it looks like we’ll have to wait until next year, or longer, for another 4-inch iPhone. The main differences between the devices are their processors, their software, their cameras, and their designs. There are also some subtle differences between the three Apple doesn’t mention on its website. In this guide we want to take iPhone 5s and iPhone 5 owners through some reasons to consider making the iPhone SE your next device in 2018. If you’re using an iPhone 5 you’re stuck on iOS 10. You didn’t get iOS 11 and you won’t get Apple’s iOS 12 update. It’s the lack of bug fixes and security patches that should have owners of older iPhones worried. Some problems aren’t easily solved and Apple’s iPhones aren’t immune to hacks and exploits. The iPhone 5s got upgraded to iOS 12, but iOS 12 will likely serve as the device’s last major upgrade. We don’t expect it to get iOS 13. You can solve this problem by upgrading to the iPhone SE. The iPhone SE should have at least two years of software support left. It should get iOS 13 next year and there’s even a chance it gets iOS 14. If you aren’t thrilled with the size of the iPhone XS, iPhone Xr, iPhone X, or the iPhone 8, the iPhone SE is an excellent alternative. You’ll be able to get two plus years out of it if you buy it this year. If you’re dealing with iOS 12/iOS 11 problems on the iPhone 5s or iOS 10 problems on the iPhone 5, it might be time to upgrade to the iPhone SE. We continue to hear and see complaints from many iPhone 5s and iPhone 5 users, many of whom are running into debilitating performance issues. Some devices aren’t holding a proper battery charge. Some devices are lagging to the point that the phone becomes unusable. Apps are unstable. The list goes on. iOS 12 has improved the iPhone 5s in a lot of ways, but we’ve been testing the software on both devices and iOS 12 on the iPhone SE outperforms iOS 12 on the iPhone 5s. If you’re struggling, consider the iPhone SE. The iPhone SE’s operating system isn’t perfect, but it’s running extremely well on the device in our possession. We haven’t noticed any abnormal battery drain and we’ve only seen minimal amounts of lag. It’s comparable to iOS 12 on the iPhone 6s and iPhone 7. This makes sense because the iPhone SE uses the same 64-bit A9 chip and M9 motion co-processor as the iPhone 6s. One of the nice perks of upgrading to the iPhone SE instead of a larger iPhone is that you get to re-use your accessories. If you’ve got a great iPhone 5s or iPhone 5 case in good condition you can slap that case on the iPhone SE right away and save yourself some cash. If you’d prefer to go with something a little bit newer, you can always shop around for an outstanding iPhone SE case. There are a ton of great iPhone SE cases out there and many of them won’t break the bank. If you own an iPhone 5 or iPhone 5s you’re currently rocking 16GB, 32GB, or 64GB of internal storage. These days, that’s probably not enough. Advancements to Apple’s iOS software have taken some of the pressure off the iPhone’s internal storage, but 16GB/32GB isn’t going to be enough for most people. Your Apps, particularly mobile games, take up huge chunks of storage. Your iMessages can take up hundreds of megabytes or several GB if you like to save them. iOS 11.3’s Messages in iCloud helps iPhone 5s owners, but the feature won’t come to the iPhone 5. Photos, videos, and locally store music can also add up quickly and before you know it, you’re forced to delete a file you might not want to get rid of. If you need more storage for your photos, videos, apps, and music files, and you want to keep the 4-inch screen size, take a long hard look at the 128GB iPhone SE. Apple added a 128GB iPhone SE option back in 2017 and it’s the perfect choice for those that want peace of mind when it comes to storage. If you want an excellent camera and don’t want to break the bank buying a new iPhone, look no further than the iPhone SE. The iPhone X and iPhone 8 obviously sport Apple’s best cameras, but that doesn’t mean the cameras on older iPhones like the iPhone SE are terrible. The iPhone 5s and iPhone 5 cameras are showing their age, but the iPhone SE’s cameras are holding up well in 2018. The iPhone SE comes with a rear 12‑megapixel shooter. The photo of this toy poodle was shot, believe it or not, with the iPhone SE. The iPhone SE also comes with an assortment of camera features including 5x digital zoom, Live Photos with stabilization, Local tone mapping, Face detection, True Tone flash, Autofocus with Focus Pixels, Tap to focus with Focus Pixels, Exposure control, Noise reduction, Auto HDR for photos, Panorama, Auto image stabilization, Burst mode, and Timer mode. It can also shoot beautiful video footage. The iPhone SE takes 4K video at 30 fps and 1080p HD video at 30 fps or 60 fps. One of the most annoying things about the iPhone 5 is that it doesn’t come with Touch ID, Apple’s fingerprint sensor inside the home button. This forces iPhone 5 users to unlock the phone with a passcode every time they want to open the phone. This might not seem annoying, especially if you’ve been doing it this way for years, but you’ll be singing a different tune after using Touch ID for a few weeks. It’s a much faster way to unlock a phone and it’s easier on those fingers. Apple’s iPhone 5s and iPhone SE share (first-generation) Touch ID sensors so there’s no obvious upgrade there. Upgrading for Touch ID might seem ridiculous, but once you start using it you’ll wonder how you lived without it for so long. If you want a smaller iPhone and you want it in the near future, you’ll have to upgrade to the iPhone SE. Apple is reportedly working on a successor for the iPhone SE, but it’s unclear when it’ll arrive and what’ll have on board if and when it does. iPhone SE 2 release rumors pointed to an arrival in three windows: Apple’s spring window in March, the WWDC 2018 in the summer, and the usual fall release window. None of these panned out and it’s unclear how the future will play out. If an iPhone SE 2 does land it’ll obviously usurp the iPhone SE as the go-to small screen iPhone option. Rumors have hinted at design improvements and performance upgrades. If you’re determined to wait, wait until the company’s spring event in March, 2019. If nothing materializes, iPhone 5s and iPhone 5 users should take a long look at the current model. 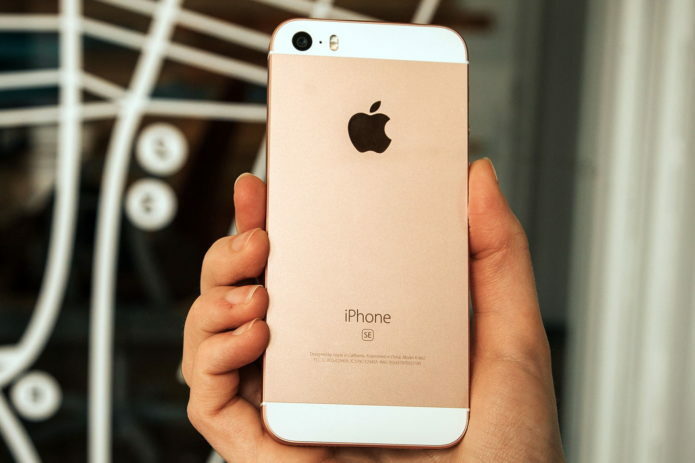 The iPhone SE might come in a small package, but don’t let that fool you. The device’s performance is on par with the iPhone 6s’ and exceeds that of the iPhone 5s and iPhone 5. If you’re looking for a boost to your performance, whether it’s from a battery life standpoint or a gaming standpoint, look no further than the newest 4-inch model. Again, the iPhone SE comes with the same 64-bit A9 chip and M9 motion co-processor as the iPhone 6s. These chips help the device outperform its predecessors in key areas like battery life and playing mobile games. Simply put you’ll get better battery life buying new phone because the device hasn’t gone through the same number of charge cycles. If you own an old phone, your battery’s degraded over time. If you own an iPhone 5s or iPhone 5 and you want to use Apple’s mobile payment solution, you need to own an Apple Watch. The iPhone SE can take full advantage of the popular service. The iPhone SE can also take advantage of an Apple Pay upgrade that arrived inside of Apple’s iOS 11.2 update. The feature lets iPhone users send and receive cash inside the Messages app on iPhones. It’s Apple’s answer to Venmo and it’s extremely handy. Apple Pay Cash is available for US-based customers only and it requires a iOS device on 11.2 or above with two-factor authentication set up via Apple ID. Maybe the best reason to upgrade to the iPhone SE is that the price of the device has dropped significantly since launch. The iPhone XS, iPhone X, and iPhone 8 are expensive, but the iPhone SE isn’t. Apple no longer sells new iPhone SE models, but that’s not a problem. Third-party retailers have some excellent iPhone SE deals. Amazon is selling an unlocked 64GB model for $300 or less and Best Buy’s offering the 128GB model for as little as $12 a month. You can also snag a pre-owned iPhone SE for around $200. If you’re fine with going through a reseller like Craigslist or eBay, you might be able to find an even better deal on an iPhone SE. It’s a great, cheap phone that’s likely worth the price of admission. If you’re determined to get into the Apple ecosystem without breaking the bank, the iPhone SE is a top choice.